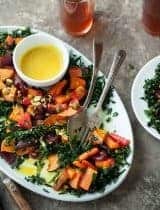 This shredded Brussels sprout and kale salad with maple-Dijon dressing is a fresh, make-ahead alternative to heavier holiday sides. A side of Brussels sprouts are a classic at the holidays, and while they can be wonderful roasted in the oven or quickly sautéed in a pan, they also make for a pretty terrific salad. 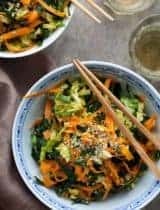 If you’ve never tried Brussels sprouts raw, you’re in for a pleasant surprise because the bite-sized crucifers work just as well in salads as their bigger cousins, kale and cabbage. (Bonus, there’s no chance of overcooking them into a sad, mushy mess either this way.) 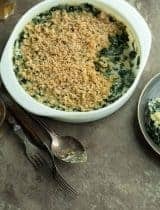 It’s a fresh addition to any holiday menu and an easy dish to bring along if you’re a guest. 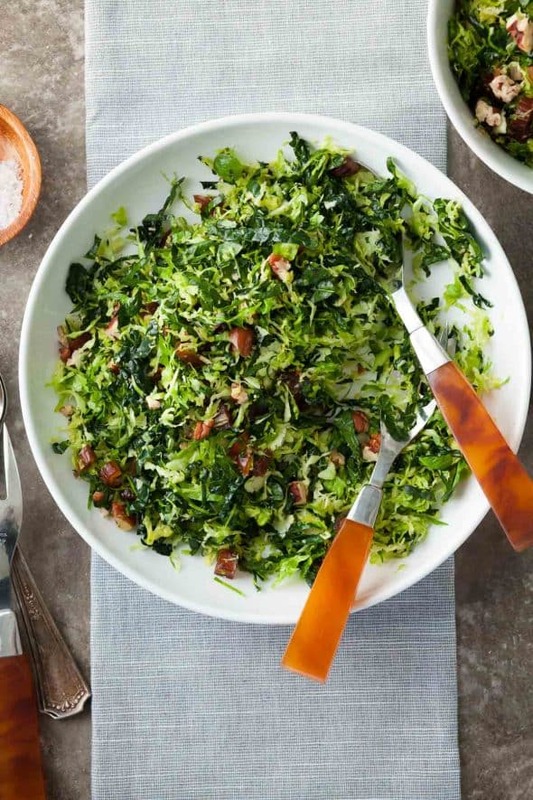 I like to pair my shredded sprouts with ribbons of kale for a slaw-like salad that can stand up to the richest of holiday fare. 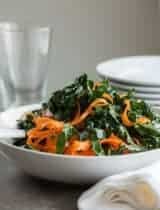 (Long-leafed lacinato kale works the best here as it’s the most tender. 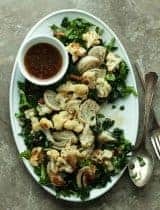 There are chopped dates and pecans and a toasted sesame and maple dressing with a hint of spicy Dijon mustard. Each bite offers the perfect combination tastes and textures, a little sweet a little savory, a little crunchy, a little chewy. 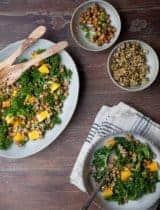 It’s not easy finding a salad that can be dressed ahead of time without taking a hit, but this one actually improves as it sits, making it a good choice for all those long, leisurely meals. 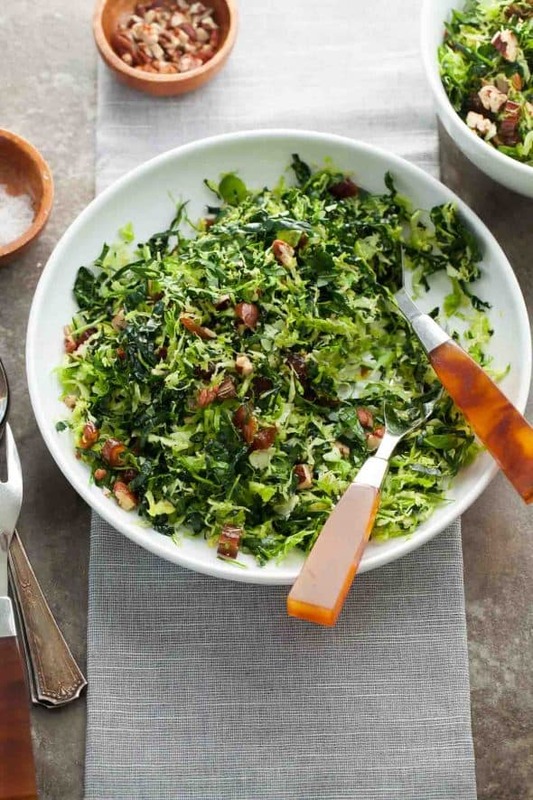 For a season defined by its excesses, this salad offers a most welcome freshness and crunch. 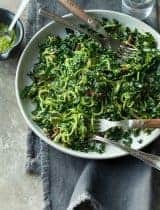 This shredded Brussels sprout and kale salad with maple-dijon dressing is a fresh, make-ahead alternative to heavier sides. 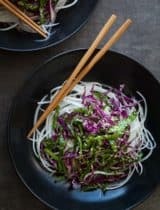 In a small bowl, whisk together the toasted sesame oil, apple cider vinegar, maple syrup and Dijon mustard. 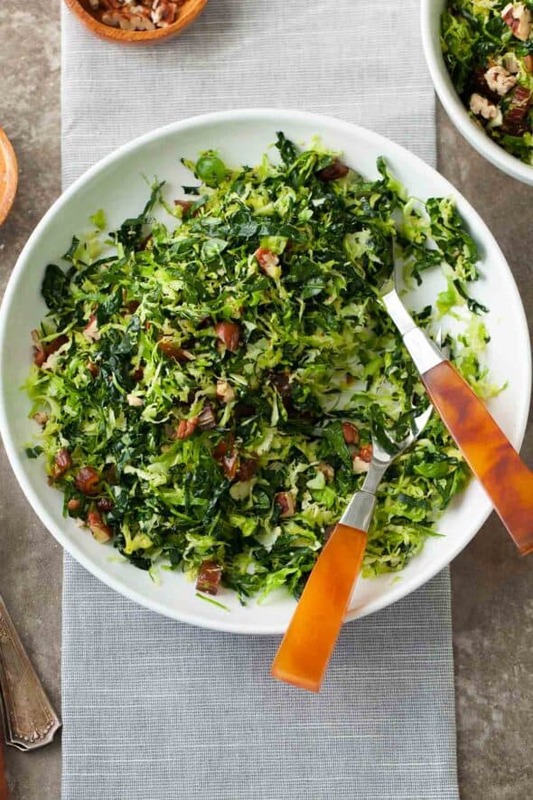 Pour dressing over massaged kale and shredded Brussels sprouts and toss to coat. Add dates, toasted pecans and green onions and adjust seasoning with salt and pepper if necessary.